Are you ready for Family Fun Night? Here are some great resources to help you and your class find the information needed for both the “Through the Telescope” and “Close Encounters” projects. If you would like to incorporate the hunt for information into your library time please contact Mrs. Bond to make arrangements. We can plan activities that help students plan the search, find the resources, use an index, extract information, take notes, anything else that will help students build and strengthen research skills. Grades 4 and 5 can make use of the Big 6. The younger grades can Plan, Do and Review as we follow the steps of the Super3. Our Library Media Center has many books, at the primary and intermediate levels. View the pathfinder to start your search. StarWalk: With this app, we can put a planetarium in our students' hands. To reserve all 6 please contact Mrs. Bond. BrainPop: The fun videos and games you have come to love share information about the solar system and individual planets. 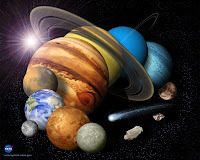 Discovery Education: Many videos and segments on the solar system and specific planets. EBSCO Searchasauraus (up to grade 2) or KidsSearch (grades 3-5): Great opportunity to introduce students to databases. As a class, brainstorm for keywords, enter the search terms, review the result list, evaluate and choose entries, extract great information. No login required on campus or from student wiki. NASA Solar System Exploration: Planets: View images, learn facts, compare planets, and explore additional resources. National Geographic Science and Space: Planets: Animated images, statistics, and up to date information. Neo K12 Solar System Resources: Images, videos, quiz games, and puzzles.